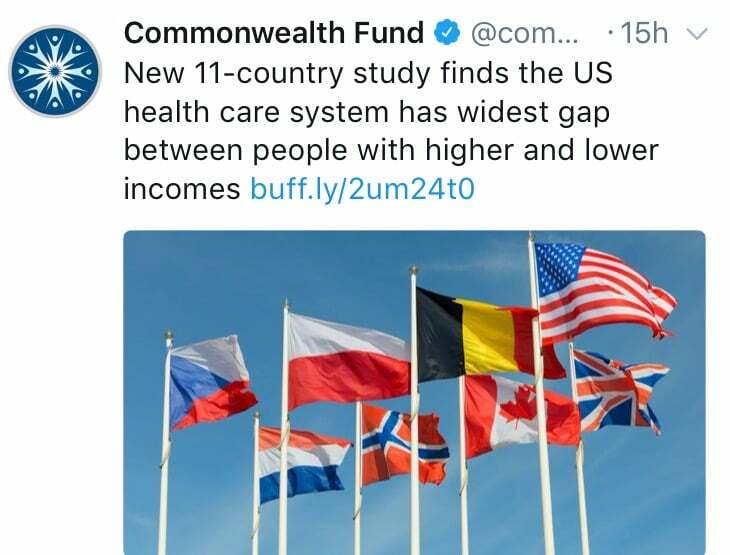 You’ve probably heard the news in the past few days that a report from the US-based Commonwealth Fund has ranked Australia’s overall health system performance as much better than that of the US, and second only (among countries analysed) to that of the UK. Trump was fresh off the plane from Washington and high on the success of the first part of his plan to repeal and replace the Affordable Care Act when he made these comments, but as Croakey prepares this post, the process has hit a roadblock, with a loss of support from several Republican Senators. As the US copes with uncertainty and anxiety around the future of its healthcare system, the Commonwealth Fund’s report provides some indication of areas for improvement. Croakey also asked health policy expert Dr Lesley Russell, if the Mirror, Mirror 2017:International Comparison Reflects Flaws and Opportunities for Better U.S. Health Care report contains any important messages for Australia. Every few years the internationally recognised, New York-based Commonwealth Fund prepares a report in the Mirror, Mirror series; there’s now more than a decade’s worth of reports dating back to 2004. The 2017 report was released last week and while the focus is primarily on lessons for the US (very timely as President Trump and Congressional Republicans seek to overturn key provisions of Obamacare), there are also some key lessons – and some warning signals – for Australia. The data (from 2014-16) come from surveys of patients and primary care doctors and reports prepared by WHO and OECD. On overall assessment, Australia ranks second behind the UK, with the US trailing in last place. Over the years since 2004 little has changed with these rankings; Australia is usually in fourth to second place, the UK is usually ranked at the top, and the US is always ranked at the bottom. An examination of the details of this study reveals some reasons to be surprised at Australia’s high overall ranking, which may be due as much to an overall high standard of living – the social determinants of health – as to the quality of the healthcare system. Australia scores high on administrative efficiency, a function of what is (mostly) a single payer system, delivers good value for money (as measured by federal government healthcare spending per person) and has the best health outcomes, although other countries have made greater improvements over the decade 2004-2014. Measures for coordinated care are below average, although Australia scores well for patient engagement. The report attributes a good performance primarily to universal coverage and ready access to primary care. In theory Australia has this – in practice, not so much for some segments of the population, which, because of geography or cost, struggle to access healthcare services in a timely fashion. All self-congratulations and praise should be tempered by the realisation that Australia ranks very poorly on equity: this indicates that the universality of Medicare is being undermined by difficulties in affordable access for many Australians. This has the potential to impact other key measures in the future, especially as there is currently little constraint on patients’ out-of-pocket costs. The extent to which the data in this report include the impact of the Medicare rebate freeze is not clear, so there is every likelihood that equity measures (which have steadily declined since 2004, when Australia ranked second among the nations studied) could worsen over time. It is interesting to look at the differences between Australia, the US and the UK for health outcomes, which are assessed using three key indicators: population health (infant mortality, adults with two or more common chronic conditions, life expectancy at age 60); mortality amenable to healthcare (and how this has changed over the past decade); and disease specific outcomes (includes measures of in-hospital mortality rates for heart attack and stroke and cancer survival rates). Australia has always ranked very well here, and the US and UK (despite the high performing NHS) rank lowest. It is clear that this measure reflects more than access to healthcare and, as mentioned previously, likely reflects Australia’s overall better socio-economic status. Housing, nutrition, environmental quality and education all contribute to health. To the extent that socio-economic status is eroding and inequity, poverty and racial discrimination are increasing in Australia, health outcomes are at risk. If there are doubts about this prediction, the UK results support the claim. In recent years the UK NHS has been under siege due to government austerity measures. The Commonwealth Fund analyses highlight the strength of this universal healthcare system, despite the constraints, but also make the case that good population health outcomes require more than access to healthcare services. This report has two messages for Australian politicians and policy makers: we know how to do many things around health and healthcare well, but lack of commitment, focus and resources can quickly diminish these advantages. This is already happening for too many Australians. It’s time to strengthen Medicare, address inequalities. *Note: The US data likely reflect very few outcomes of the changes implemented under Obamacare that will improve access to care. Hopefully the Republicans will fail in their efforts to repeal and replace the Affordable Care Act, and the flaws in it will be fixed to enable the law to work as intended. Maybe then the US will no longer be at the bottom of the rankings. Good on you for raising the issues around equity. As anyone who has been involved in health care policy and analysis knows, Australia’s health care arrangements (its not a system, more shamozzole) is falling the very people who need it most. If you are indigenous, if you live in rural or remote Australia (or for that matter many low income urban areas), if you need dental work, if you have mental health problems, or god forbid, have all of these characteristics, then you are in the lucky dip category. No universal care for you. Take this, albeit extreme example, of the gross inequities in access to medicare subsided psychiatry services. If you live in Blacktown, an LGA with a population of 330,000 people, then there are no (that is nil, zip, zero, zilch) psychiatrists practicing in your LGA. But if you live 40 kms away in Mosman LGA – population 32,500, then there are a mere 2100 mediate subsided psychiatrists available to you. Leaving aside your capacity to pay the out-of-pockets coast – now among the highest in the world – the good folk of Blacktown have to pack a lunch and head off across town to find a private provider or wait until they are suicidal or homicidal to et access to the public mental health services. The point I’nm making is that any analysis of an entire health care system is very limited. It does not account for the daily human experiences of care and if you have chronic, multiple conditions, mental health disorders or numerous other illnesses, then do not expect to get the world’s second best care. Expect far, far less.